Marysville’s Ethan Turk (top photo) and Sophie Taracko (bottom photo) are pictured during Thursday evening’s triangular meet. The Monarch squads placed second in boys and girls competition. 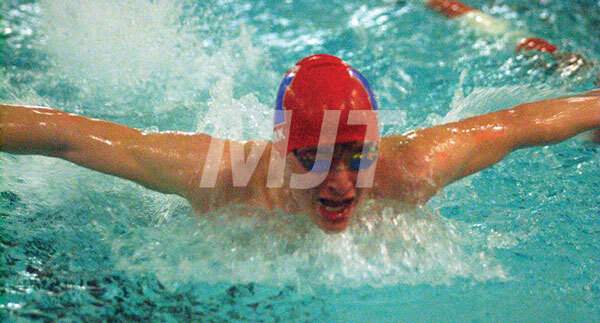 Marysville High School’s girls and boys swimming teams placed second during triangular matches on Thursday’s Senior Night. Delaware Hayes won the girls meet with 160 points, followed by MHS-118 and Buckeye Valley-18. Hayes also captured the boys meet with 117 points. The Monarchs tallied 86 and BV finished with 47. Seniors who were recognized were Jenny Larsen, Cori Lee, Karlie Marlatt, Rachel Poling, Emily Rodenhausen, Olivia Thallman, Maddie Watts and Jacob Meyer. 100 breaststroke: Hank Luther, 1:04.66. “Although we placed second to a stronger Delaware Hayes team, this was an outstanding dual meet for us,” said Monarch coach Craig Faircloth. “I’m very pleased to see our teams’ hard work continue to pay-off with many individual and relay best times. “We are starting to taper all of our swimmers for next Saturday’s (Feb. 9) sectionals at Upper Arlington,” he said. “Based on where we are tonight, I’m very confident that our team is setting up for a very fast meet at the sectionals.